William James Morrison Andrews was the eldest son of Alexander and Violet Andrews. 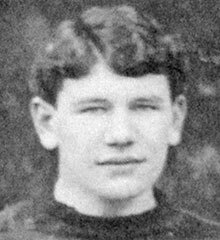 He was born at Dungannon about 1891. They lived at Chapel Road, Dungannon. His father, Alex was a tea merchant. James attended the Royal School Dungannon between 1903 and 1908. He studied engineering in London and by December 1916, James had joined the Royal Flying Corps. In May 1917 he was promoted to 2nd Lieutenant and began training as a pilot. 2nd Lieutenant William James Morrison Andrews was with the Royal Flying Corps when he was killed in a flying accident on Salisbury Plain on 4th June 1917. He was 26 years old. Drumcoo Cemetery is in Dungannon.on the Coalisland Road. 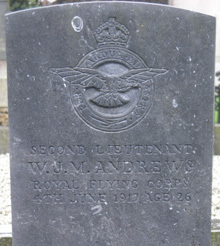 4 War Graves Photographic Project Photo of WJM Andrews's headstone can be purchased here.